Visual Latin ~ Worth Taking a Peek! Recently, we had the opportunity to review Visual Latin. When I informed the children that a new Latin program was on the way, there was a bit of groaning. We were (sporadically) using a different Latin program. It seemed to be working well and we were all a bit hesitant to work with something new. What a delight to find that Visual Latin is an outstanding foreign language program that truly engages the student and is enjoyable to learn! Dwane Thomas does a wonderful job of presenting the information to the student. He speaks to the student, adds a bit of humor and is very down to earth. His excitement and enjoyment of the Latin language is clear to see from the beginning. Visual Latin is simple to use. So simple that you might be fooled into thinking that real learning could not be happening. I think the short lessons and the method of presentation are two of the things that make this program so effective. First is Grammar. Dwane presents one or two grammatical concepts; clearly and simply. He explains the concepts and gives plenty of examples to reinforce it for the student. After viewing the grammar lesson, a worksheet is given that reviews the material. Once Grammar has been covered, the second part of the lesson is Sentences. In this section of the lesson, Dwane takes what was learned in Grammar and breaks it down. It really aids in the understanding of Latin. This section also has a worksheet that helps reinforce what was covered. The finally part of the lesson is Reading. When my girls first saw this part they were a bit freaked out. Now they love it! In this section of the lesson, Dwane actually reads Latin text. As Dwane reads, the student is to repeat the text in Latin. When Dwane is finished, the student has a worksheet with the Latin text and the student has to translate it. So the student is seeing, hearing, speaking and writing Latin. What an effective way to learn the language! What Latin text is Dwane reading? Dwane used the Latin Vulgate Bible so the children are familiar with the accounts that are read. Having this background knowledge aids in the speed of learning Latin. Visual Latin has been a huge success in our home. My girls are learning and enjoying a foreign language that will build a foundation to make other languages easier to learn. And it is independent. They do not need me at all for this course. With Visual Latin, Latin has become an everyday thing in our home. During some free time, when the girls were entertaining my younger ones, they gave Latin names to them. They are constantly sharing with their dad what different Latin words mean. I love that they are retaining so much and enjoying it in the process! Intrigued? Want to take a little peek? Visual Latin provides a wonderful opportunity for you to sample the course for free! Interested in viewing a sample lesson? Just go here. Want to really put it to the test? You can download the first six lessons here. Yes! For free! Ready to make a purchase? There are two ways you can bring Visual Latin into your home. 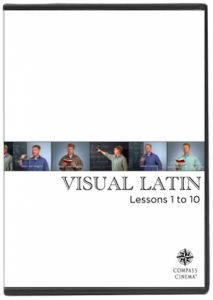 You can purchase Visual Latin DVDS or chose to Download the lessons to your computer. The PDF worksheets for the course are contained on the DVDs/Download. There are 30 lesson for Latin 1. You can choose to purchase them all at once or Visual Latin gives you the option to buy 10 lessons at a time. Pricing ranges from $25 for Download of Lesson 1-10 to $80 for all 30 lessons on DVD. With these options, you can easily work Visual Latin into your home education budget! Make sure you head over to the Crew and see what other families thought of Visual Latin! This entry was posted in Homeschool, TOS Crew Reviews and tagged classical, computer, curriculum, Homeschool, language, reading, review by sweetie. Bookmark the permalink. We love Visual Latin, too! You know… I don’t think I have read a negative review about this program, at all!